SMA hosted a speaker session presented by LTC David Doran (US Army), LTC Steven Meek (US Army), and Lt Col Bryan Bailey (US Air Force) as a part of its Future of Global Competition & Conflict Speaker Series. Their talk focused on the first four chapters of their report, entitled “Adversarial Competition in the 21st Century.” LTC Doran discussed how adversarial competition has become the “new normal” and the defining geopolitical struggle of the 21st century. He then outlined the report’s four primary objectives: 1) to gain a better understanding of the current state of great power competition, 2) to develop models to account for and explain what occurs between rivals, 3) to use these models to enhance strategy and policy making, and 4) to apply findings to the most prominent great power competition—the competition between the US and China. 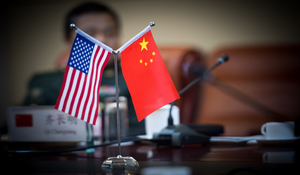 LTC Doran then explained where modern competition between the US and China lies on the competition continuum—in an area defined as “adversarial competition,” which lies between “cooperation” and “conflict.” While these activities cannot be described as “friendly,” they fall short of conflict. Within the adversarial competition spectrum, countries compete in an environment in which they make, bend, and break rules in an attempt to shape the dynamics of the competition to their advantage. LTC Meek proceeded to discuss the 4P Adversarial Competition Model, which describes how nations protect, play, prevent, and promote while engaging in this form of competition. He stated that success in adversarial competition requires that competitors continuously play, prevent, protect and promote according to their own self-defined instances for relative advantage. Lt Col Bailey then presented the reports’ primary findings and two categories of recommendations: more general and Joint Force/Department of Defense-specific. To conclude, LTC Doran explained that in this current state of competition, great powers will try to achieve maximum benefit and advantage without moving into traditional conflict.